This strong statement was made by Tim Brown – CEO of IDEO, when he came to Singapore last year to talk about the role of design. I cannot agree more with him. Design is no longer a finishing touch, or form of nice look & feel. Design is much more than that, if not everything. Design is your intent, gesture and your statement. Design is the way customers interact with your company. I observe that more and more companies embrace what design can be, owing to what design-obsessed leaders like Tim Brown and Steve Jobs have shown to this world. Then what happens to the designers? If you are a trained designer in whatever field, what does this mean to you? How can you, designers, embrace this big notion of ‘design being a big thing’? I suggest two equations to answer this question. 1. Big design = System thinking and experience design. Design is the way customers interact with you. There is the customers, your products or services and there is anything in between. Big design is about the system thinking and the ‘experience’ that happens anything in between. This involves not only designing customer facing interfaces, but also designing the way we communicate and the way processes work. It seems to be a big thing, but fret not. You, designers have natural ability in connecting dots. You are not afraid of sketching out your thoughts. You can help companies visualize the systems and the problems to solve. You have what it takes to be a system thinker and an experience designer. Once you understand your imperative, you can use your design skills in designing the new big. But the challenge comes with this second equation. Designing system and customer experience is not a one man show. Even it’s not a one department show. This requires a cross-functional coordination and persuasion. How are you going to do this? Some people may argue this is all about one’s soft skill, the natural ability to persuade others. Some people may say, it’s all about your authority, the given position within the organization. In many ways they are both right. One’s soft skill and the authority are important factors in delivering successful design initiatives. However I would argue that the first step to drive cross divisional design initiatives is seeing yourself as a change agent. Do not live in the world of the black design portfolio, which designers used to carry to meet their clients. Instead put on a different shirt. Pay attention to process of how you influence the people’s decision, not only the outcome of decisions. Awareness is the first step to become a change agent. 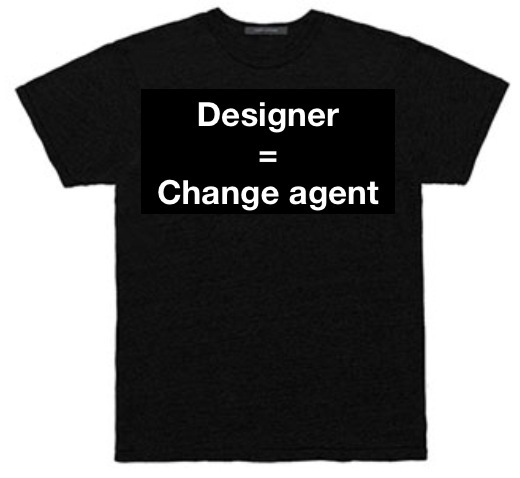 Part 2 will cover what can designers learn from some of change management theories.